Our MRI Audio System is an Internet Radio/FM-RDS/Aux In/CD/USB/SD/ with an iPod Cradle. This all-in-one tabletop wooden cabinet musical system transforms your listening experience. Featuring more choices, crystal-clear sound, the new DDR-63 all-in-one musical system lets you enjoy your music the way it was meant to be heard. 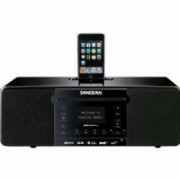 Made for iPods, this system allows you to listen your favorite tunes using the Integrated docking station. If you get bored with the songs on your iPod, the DDR-63 has a built-in WiFi Internet Radio, CD Player, USB/SD Card and FM Tuner letting you listen to your favorite recorded music and talk radio. The large Backlit LCD that displays the current FM frequency; the Touch Pad buttons provide full access controls. The tuner also features a Memory for ten presets on FM, 99 station presets on Internet Radio and a telescoping antenna for better reception.